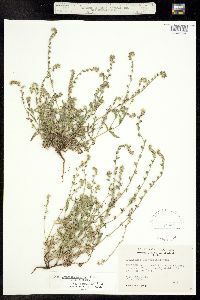 Amsinckia menziesii (Lehm.) A. Nels. & J.F. Macbr. 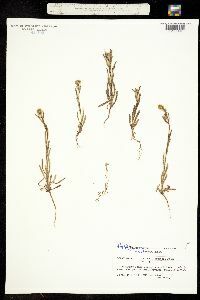 Annual herb 15 - 80 cm tall Stem: unbranched below, erect, and covered with long, white, firm, bristly, spreading hairs. 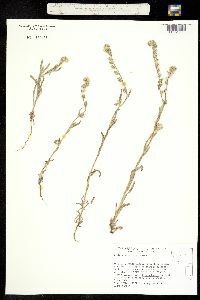 Leaves: alternate, mostly stalkless, non-toothed, narrow (under 1 cm wide), oblong, and covered with appressed and spreading, bristly, swollen-based hairs. The basal leaves are almost linear, but the stem leaves gradually become wider up the stem. Inflorescence: usually of at least two, spike-like, many-flowered branches with lower flowers subtended by leaf-like bracts. The flower “spikes” are tightly coiled at the top and uncoil as they mature. Flowers: numerous, yellow to golden-orange, small (under 1 cm tall, less than 4 mm broad), tubular or funnel-shaped, and radially symmetric. 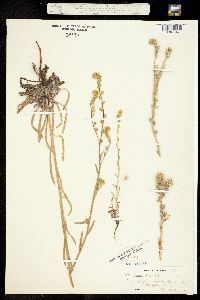 Sepals: five, but fused at base, then separating into lobes over 5 mm long which are covered with firm, bristly, 1 -2 mm long, somewhat golden hairs. Petals: yellow to orangish, five, but fused into a tube for most of their length, then separating into broadly flaring, rounded lobes. Stamens: five, attached to inside of petal tube, and not exceeding the tube in length. 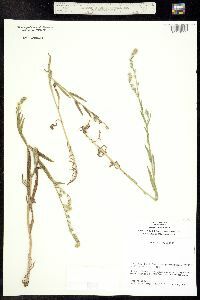 Pistil: with a four-lobed, superior ovary; a single, slender, threadlike style; and a single stigma that is included within or scarcely extended beyond the petal tube. Fruit: a stalked (at least the lower), cluster of four, pale, bluntly warty or bumpy, over 2 mm long, three-sided, egg-shaped nutlets. Root: a stout taproot over 5 cm long. 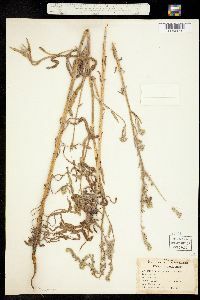 Similar species: Amsinckia menziesii is the only species of Amsinckia that has been collected more than once in the Chicago Region. 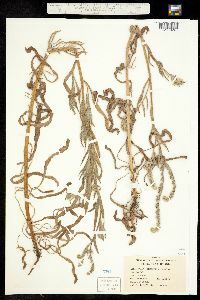 Another introduced species, A. spectabilis, was reported in 1945, but never seen again. That species differs by having jagged-toothed leaves, smaller nutlets (under 2 mm long), and the nutlet surface is sharp and bumpy. Both species can be differentiated from members of the genera Symphytum and Borago by the narrower leaves and non-winged leaf stalks. 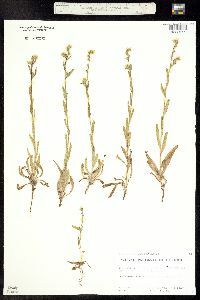 Species of Lithospermum differ because they have two stigmas and a two-lobed style. 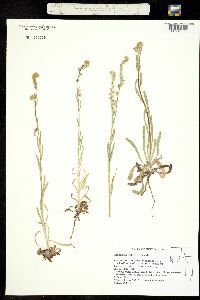 Habitat and ecology: Found only at a single site in DuPage County, IL along the shoulder of a highway, this species is native farther west of the Chicago Region.